One of the latest editions in the famous Lunar II series from Australia's Perth Mint, the 1/4 oz Rooster is a terrific introduction to bullion trading for new investors. These striking coins represent an affordable way to add pure gold to your collection or portfolio and they also make delightful gifts. 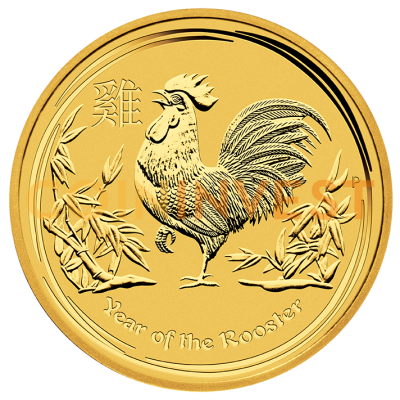 Each 1/4 oz Lunar II Rooster Gold coin is struck from the finest .9999 pure (24 carat) gold. Numismatics value these coins for their yearly changing design as well as for their purity. The new 2017 1/4 oz Rooster Gold coin was designed by Aleysha Howarth and shows a rooster standing among clumps of grass within a circular edge pattern of etched lines. The Pinyin pictograph that is pronounced 'ji' and which means 'rooster' is inscribed on the coin along with 'Year of the Rooster' and the designer's initials.